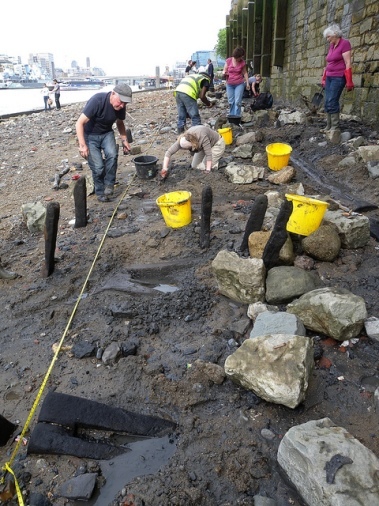 TDP first worked at the Tower of London foreshore in 2010 and have been back every year since along with MOLA Geomaticians, Thames Mudlarks and specialists from the Portable Antiquities Scheme. The field work has been generously funded by the Heritage Lottery Fund, Historic Royal Palaces and the Crown Estate. 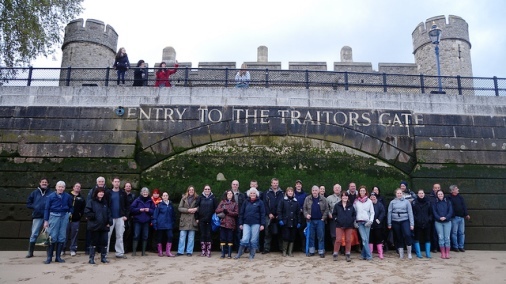 115 individual FROG members have contributed to the discoveries at this site, many coming back year after year – VERY many thanks to everyone who contributed for your hard work. 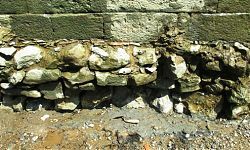 In the course of our work it was established that the base to the river wall in the eastern area of the site was becoming unstable, as a result Historic Royal Palaces paid for a series of watching briefs and foreshore surveys using professional TDP and MOLA staff in that area of the site as part of the remedial works. 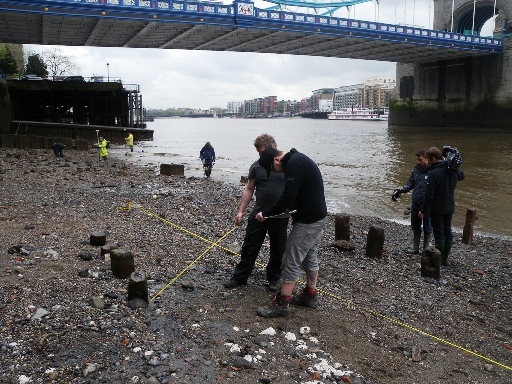 The Thames Archaeological Survey, carried out in the 1990’s, recorded only a single feature at the eastern end of the Tower foreshore – the cofferdam constructed for the building of Tower Bridge in the 1890’s – for the simple reason that it was the only one visible. 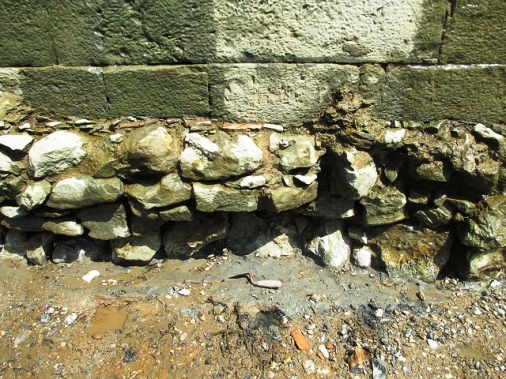 By the time of the first TDP survey in 2010, the area had changed dramatically, the foreshore having dropped in places by as much as a metre, revealing a palimpsest of timber baseplates, braces and piles. Over the course of the next four years this area of the foreshore continued to drop by as much as 0.40m in places. 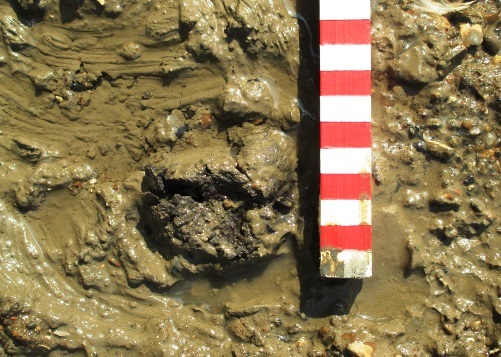 At least three possible fish-traps or similar structures were recorded on the site. 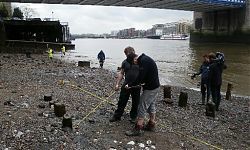 All other fish-traps found so far on the Thames which have been dated were constructed during the Anglo-Saxon period (5th-10th centuries AD). The dates returned from radiocarbon dating of the Tower traps (5th/6th century and 4th century) suggest that one of them was in use before the collapse of Roman Britain. These three similar structures would seem to indicate activity (and potentially occupation nearby) over a period of at least some 200 years; whether this represents continuous usage is not clear. During the Mid Saxon period the main settlement of Lundenwic was located in the area of the Strand, there being little previous evidence of activity in the vicinity of the Tower. 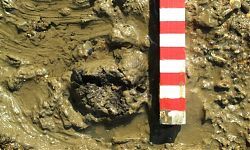 The 5th/6th century dates indicate Saxon activity in the area, possibly related to a previously unknown settlement; while the 4th century date suggests an even earlier trap, dating to the late Roman period. A large elm jetty was recorded at a slightly different angle to the current 14th century river wall, although a sample was taken for radio-carbon dating but no useful date was returned. The position of it, however, suggests that it may well pre-date the river wall, while it is of such size, construction and location that it would have been able to service large sea-going vessels, and may well have been used to offload the stone for one of the construction phases of the Tower. Two phases of possibly early river stair may well have complemented the jetty, allowing small craft to be accessed at low tides. Moreover, their alignment suggests a possible river bank alignment pre-dating the late 14th century river wall. Given that the White Tower was built close up to the Roman wall, it may be that any accompanying ditch outflow may have created an inlet in the river bank at a slightly different alignment, and as this ditch appears to have been blocked during the building of the curtain wall to the Inner Bailey (completed c.1295), this conjectured river bank location may pre-date 1295. 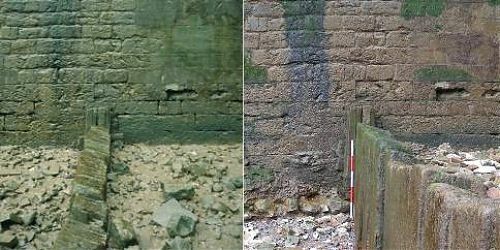 The lower courses and foundations of the 14th century river wall were recorded, while the construction cut was observed to lie below the level of a number of baseplates, suggesting that the later piles and baseplates indicate revetting and consolidation of the foreshore to protect the exposed foundations. It would seem that erosion has not just been a modern phenomenon here. Given the location, below the arsenal of the Tower, one can suggest that heavy traffic to and from the wharf may have resulted in severe erosion. 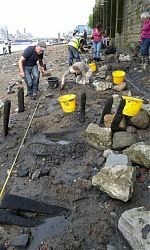 The preponderance of 17th century finds recovered, in conjunction with documentary evidence detailing the construction of campsheds at the Tower foreshore during this period, implies that this indeed may be the case. 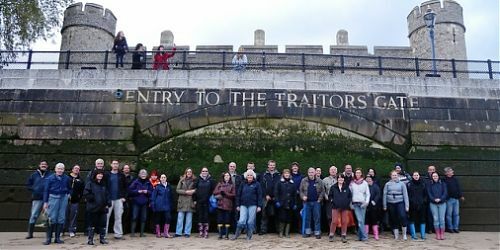 One can say that without the work of the TDP volunteers, these features would have gone unrecorded and that the story of this part of the Tower foreshore would have never been told. The first evidence of early Saxon activity in this area, a jetty and possible river stairs, possibly predating the 14th century river wall, along with evidence of early post-medieval foreshore erosion and subsequent remedial work are all significant discoveries; the TDP of the future may have a chance to record this area further, possibly in a hundred years or so time, when the new concrete consolidation itself is eroding away.